“I grew up in Maryland in a predominantly white neighborhood in Rockville,” he relates. “I felt generally white. But being biracial, I felt some prejudice. The other thing that really got me thinking about social change was coming out as a gay man as a teenager. I savor that experience growing up. Being able to feel, as a biracial, a part of the community but later when I was struggling with issues of sexuality to give me a framework for understanding other folks who are facing different kinds of oppression, whether it is anti-black racism or something else. Kohei feels that farming has an important role to play in community organizing. Growing up, Ishihara did not connect to local or fresh food. It was only later, following his love of plants and ethnic foods, that he got into farming. 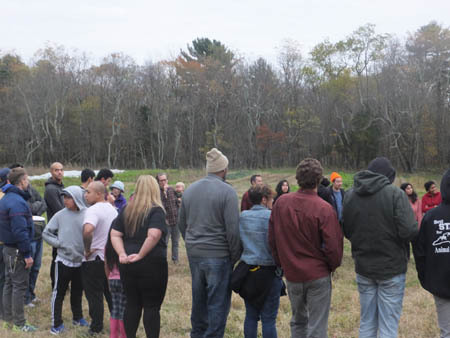 Before starting his ‘Movement Ground’ farm he worked for three years on farms in Raynham, Massachusetts, where he learned the practices he uses. The vision of the farm. Kohei says, is to connect people and empower them through a connection to land. 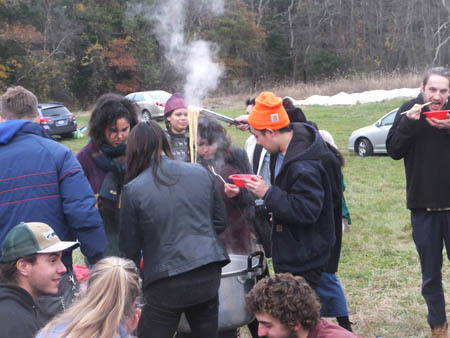 Asian egg noodle soup was just one of the many ethnic dishes Kohei prepared for members. Most of Kohei’s members had never belonged to a CSA before. They are often people who have been involved in racial or social justice work and not really focused on food or nutrition. The CSA delivers to sites in Providence and Boston that are connected to the social justice-minded organizations in those cities. In Dorchester it is coordinated through the Asian American Resource Workshop, for example, which shares a building with the Vietnamese Aid Center — an organization in Fields Corner of young Asian professionals who are interested in supporting community organizing and social justice issues within the Asian American community. 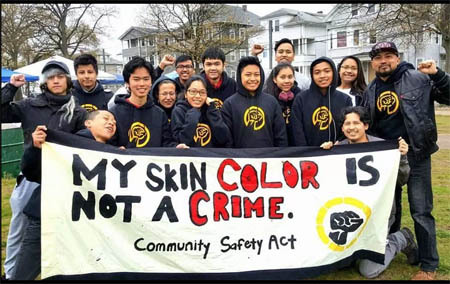 In Providence his site with the most members is at the Providence Youth Student Movement, which does Cambodian, Laotian and Hmong youth organizing. “A lot of my CSA members,” he beams, “are members of those groups. I grow a lot of Asian food for them. I have chickens, ducks, emus, quails, and goats. Ducks are really central to Asian cuisine, and you don’t see many of them at farmers markets. Nobody will slaughter them, because their feathers are hard to pluck. So we do it here. We got the mobile processing unit and some detergent for the hot water to cut the oils. It made a big difference. Ishihara gets $8 a dozen for his chicken eggs. He feeds them organic grain, which is expensive. He also wanted to try raising turkeys. Of course turkey isn’t Asian, but he said he just wanted to try it. He raised 40 in 2017. Every week his CSA members receive five vegetable items as well as a half-dozen eggs, if they have chosen the option of receiving eggs. For example, on one summer week they may get something equivalent to a pound of tomatoes, a bunch of carrots, a pound of green beans, a head of lettuce, a whole watermelon, and a half dozen eggs. 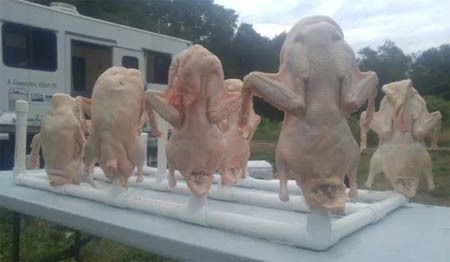 Meat is delivered on ice in coolers on a specific pick-up day twice during the summer. In the fall, the turkey pick-up is at the farm. Ducks, a popular Asian food, are difficult to clean because their oily skin prevents hot water from loosening the feathers. So Kohei cleans them at the farm with his members. The price for a share depends on the season and the contents. Full summer shares go for 17 weeks at $30 per week if they include eggs and meat. It is about $6 a week less without them. Full fall shares go for 12 weeks at about $35, and full winter ones for 8 weeks at $18.50. 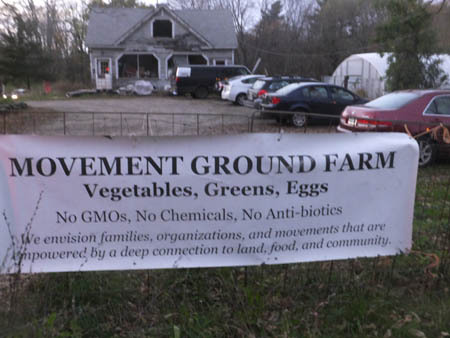 Movement Ground Farm has several mechanisms to be more affordable. For starters, they offer a 10% discount to those who sign up for all three seasons. They also let members opt to schedule automatic payments throughout the season rather than pay everything upfront, as traditional CSAs do. Also, Kohei has a limited number of ‘Food Justice Discounts’ to give out to those who qualify. He also asks members to donate a day of work at the farm. Although Ishihara is not certified organic, everything he does uses organic methods, including organic feed for the animals and using only organic fertilizers — OMRI listed ones. He has been buying in compost but now is thinking of making it. The birds have generated a lot of manure he can use! Racial Justice work is important to Kohei, such as this successful effort to pass a racial profiling law to provide police oversight. But he admits he is still learning, after 3 years in farming. For example by the time I visited in early November, 2017, Kohei still hadn’t sown cover crops for the winter. Gladys Gould, who lives in South Providence, is a good example of one of the Movement Ground CSA members. She met Kohei when he was doing community organizing in her area. Originally from the Dominican Republic and now in her mid-fifties, she had also been a community organizer and worked a stint as a labor organizer for AFSCME Council 94. Now she is active in PrSYM, the Providence Youth Student Movement, which just concluded a successful 7-year struggle to pass a municipal racial profiling law to ensure community oversight over police misconduct — Kohei calls it ‘the most comprehensive racial profiling law in the nation’. She has her own garden at home, but joined the CSA and loves it. are among the items roasted on his homemade barbecue. I caught up with Kohei and about 100 members and their guests at the annual farm Harvest Celebration. Rescheduled from September because the farm work was just too intense then, this early November date worked for all and delivered a beautiful Sunday fall day. 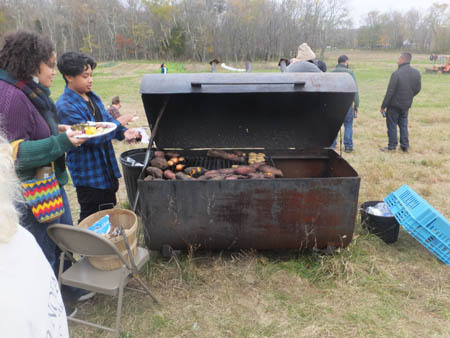 The celebration, with tours, games, and a massive feast of farm meat and vegetables plus plenty of beer and lovingly made spicy Asian wraps and egg noodle soups, is free to CSA members. They get two free tickets for each CSA they join, qualifying a family joining for the summer, fall and winter to receive six tickets. Others can come if they pay at the street before entering the farm. “This morning we had a number of other farmers here,” Kohei reports, “and started with a barter event. It was nice not to use money but to build community. One family that came was of fishermen. They bartered their stripers and bass and cod. Several farmers came with various products, cranberries, chicken, pork. It is our third year doing it. Most people here now who have stayed into the afternoon are members of the CSA. Everyone here has connections to community organizations or other people and has brought their friends and families. CSA members at the Movement Ground barbeque line up for a game while awaiting dinner. One of the treats Kohei arranged for the celebration was for people to meet his parents. His father, Michio, came to the US in 1968 when he was 23. “In the mid 60s in Japan,” he recalls, “we had major student demonstrations against the US/Japan peace treaty. It meant that we were under the protection of the US’s nuclear power. So in our constitution we declared that we would not have an army. At the time Marxism was very strong in the colleges. I was in my junior and senior years at college. We would throw rocks at police and we barricaded the graduation ceremony. My father said: ‘why don’t you go to the United States and see what is happening there. You are not going to school anyway, you are not studying.’ So I said ‘okay’. Michio ended up with an advanced degree in economics and a job at the World Bank, hence Kohei’s childhood home in Rockville. His mother, Melody, is a musician who sings and plays the piano. She and Michio met during his days at the University of Missouri. These days she visits nursing homes and offers music and art therapy to help needy people who don’t even have family members left visiting them. One of the realities that Kohei mentions often is that farming takes more time than he anticipated – which makes it difficult for him to achieve the larger goals he originally intended. “I would like to do more workshops and educational events,” he says, “but I’m learning farming consumes all your time! I don’t have time to do other stuff like a newsletter, or workshops. I feel education is crucial for a CSA. But how do you have time to educate people about what vegetables they are getting and how to use them? I did a weekly blog for a while, but I couldn’t keep it up. That stuff is really important to giving people the full experience. The economics of the farm are not important to me so long as they are sustainable. “I realize I need money,” he continues, “to get other people to help doing all this stuff! I have good people who can help. I have summer help on the farm, and one person who is still working with me now. But it is too much! The interest is there among members, but I haven’t yet figured out my sustainable model to make it all work. Kohei wonders if perhaps starting a non-profit may be the best way to avoid burnout or bankruptcy. In a way it is a false economy, he feels, but if that is what he has to do, he’ll do it. His long term goal has evolved to having a strong non-profit which can do social justice work – ideally a retreat center which could have programs and enable people to stay on site and participate in the growing too – and eventually finding a good partner who can run the farm operation. Of course such a goal would require purchasing the land, which means a significant capital investment and also land which is suitable for these purposes but also not as close to urban areas and their housing-driven land prices as he is now. He is now setting up an exploratory committee to help figure this all out. 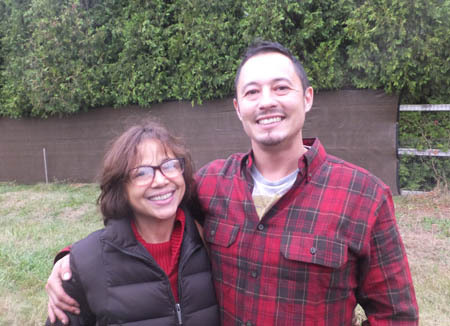 His parents are onboard with the idea and have sold their Mendocino, California home to raise capital. They hope to live at the new location. His sister, who is currently doing a residency in California, is mostly on board too, which would enable them to tap into a doctor’s line of credit! Kohei would like to buy the land privately, run the farm on it, and raise money for the retreat center and non-profit work.